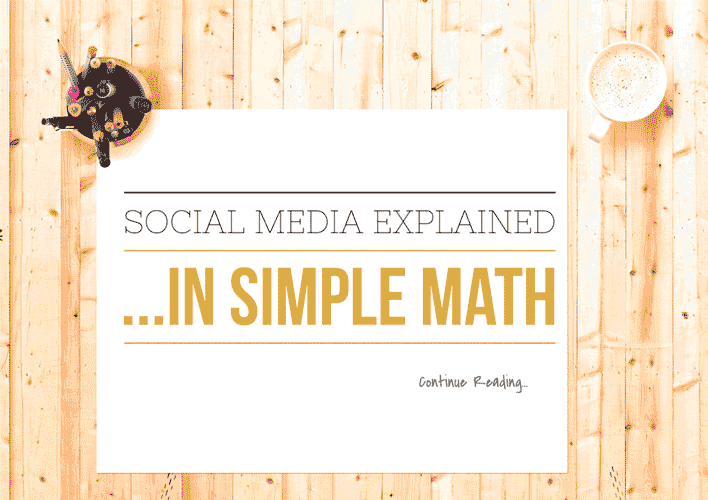 Social media explained in simple math is an attempt to simplify and demystify social media. Also, it is an attempt to debunk common practices and perception about it. These are fundamental lessons that I’ve learned for 6+ years now. Kindness thrives in social media. What it means is that to get more followers/fans, likes and RTs or reshares, you would need to take the initiative. You may try asking but if you are just starting and haven’t formed and somehow established relationship yet which (takes time) that is too much to ask. Grab others attention by giving them YOUR attention first. “Like” them, retweet and mention them. Honestly, not everyone but that means that you can repeat the process, sift the ones that respond to you – put them in a list them move on. This would have something to do with groups, communities or forums. Groups have rules whether that’s LinkedIn, Google+, Facebook, etc. You may get excited to tell others in the group about how awesome you are, how great the products and services you’re selling, and how great the article you write. Hold your horses before doing anything. Best practice when in new in a group: listen first. Groups typically have rules as standard. Look for it. An example is a group for the just-concluded Social Media Content Challenge that I hosted, a.k.a #30DaysofSoMe. The Google+ group is a hub for participants. It has zero-tolerance for spam/sales-y posts. Even with rules spelled out, someone still attempted to spam it. Spamming devalues the value of a group. You could get banned from the group if you abuse access to ir. If you are unsure about rules, ask the moderators. Email is another story. Just because someone gave you their email address doesn’t mean that you can send them 2-3 emails per day, much less EVERYDAY. Thankfully, there’s “unsubscribe” as an option. Your effectiveness is not equal to the number of posts you share or how much time you spend in social media. Social media is important but keep it in check. More is not always better. Focus on what yields results. You will exhaust your valuable time especially if you are a startup, or a small business with very lean resources. Optimize your activity by being timely, and by making posts shareable. Provide content that are relevant and helpful for your target audience. If you are writing a blog, and if you’re a small business, focus on evergreen topics. How would you know what topics your audience like? Find out by checking Analytics, for one. You don’t have to do this everyday but doing it regularly is beneficial for your business. Need help? *cough* I offer social media coaching. Oh, here’s one easy way to find out, ask them. Others would argue that a tweet should be much less than 120. THAT is not my point though. My point is this: Give retweeters room to retweet your post. Want people to retweet your tweets, right? Help them help you. ~ 80% of content should benefit the audience. Content doesn’t have to be linear but, for certain, it has to be and should be for your audience. Mix it up. ~ 20% of posts about your product or services. Should you be sharing business-related content in your personal profile? I do not use it as a platform to sell to my friends and family but I sometimes share content from my page that I think my friends and family will like. No matter what you do. Social media should drive leads toward the company’s bottom-line (of the funnel). Likes won’t pay bills. Likes won’t pay employees’ salary. Social media CAN be used as a tool to help drive sales along with other marketing media tools that you use for your company – email, press release, marketing slicks, website landing page, etc. It can be used to collect leads and to track sales-related pre-determined key performance indicators (KPIs). Note: Social media is just one of the tools but it is an essential tool especially these days. Posting is not engaging with your audience. Analytics and Insights have different ways of looking at engagement technically. Don’t miss the “social” in social media though. Engage. If no one is engaging with your brand, don’t wait. Take the first step. Get out of the broadcasting mode and start engaging with others. Hubspot did a really interesting study in Facebook. Some niches are engaging and others are yet to catch up. Mention analyzed over 1 billion social mentions from the past two years, and in their analysis they found that 91 percent of mentions come from people with fewer than 500 followers. I believe this to be true in my experience. Therefore, don’t get obsessed on getting the attention of the influencers those with thousands of followers. Find and develop relationship with brand advocates. Why should you build a relationship with brand advocates instead of chasing influencers: here’s the answer to that (click THAT link). Both are goals. To achieve each would sometimes require different strategies and you’ll be looking at different metrics as well. A startup client recently asked my opinion on their plan to pull out their account from Twitter. I told them that I’d check their Google Analytics before I’d give them my advice. They like Facebook. They like Pinterest. Brand Awareness is their topmost goal. I showed them THIS report (see image below). While, it is true that they are getting a lot of traffic from Pinterest, their pinners aren’t spending time on their website. On the other hand, their Twitter visitors are clearly doing “something” on their website because they are spending MORE time there. There’s brand awareness KPI. It all boils down one thing, the goal. Unless you have a person focused to do social for your company full-time, focus on one goal at a time because you can’t be best at everything at the same time. Imagine going to a business networking event without a business card. You exchange business cards with people at networking events; not carrying one – all the time – is networking fail. That is what a social media profile is like. Complete your profile first before asking others to follow you. You are not just engaging with an avatar, or a logo. You are engaging with human beings; therefore, humanize your posts. Show your personality. Show people who you are and the people in your team. Chef Ivan Flowers Facebook page is an example that comes to mind. He does not only share tips and the food he prepares but he also sometimes shows a photo of his team – and that they like to have fun in his kitchen too. There’s social media explained – in simple math. Anything else you like to add?